The Winter Festival of Lights is Prince George’s County, Maryland’s drive-through Christmas light display featuring more than a million twinkling lights. The Department of Parks and Recreation sponsors this event, and it is one of the most affordable light displays in the region. The event takes place Friday, November 23, 2018, through Tuesday, January 1, 2019. You can drive through from 5 p.m. until 9:30 p.m.
Watkins Regional Park is one of the most popular parks in the county. The park has playgrounds, picnic areas, hiking and biking trails, Watkins Nature Center, the Chesapeake Carousel, Old Maryland Farm, the Watkins Regional Park miniature train, Watkins Miniature Golf Course, softball, football and soccer fields, basketball courts, indoor and outdoor tennis courts, and 34 campsites. Directions: From the Capital Beltway (I-495), take Exit 15A (Central Avenue) east. Continue for approximately three miles. Turn right onto Watkins Park Drive (Route 193) and follow the signs to Watkins Regional Park. From Route 301, turn onto Central Avenue (Route 214) west. Continue for approximately three miles (past ​Six Flags America). Turn left onto Watkins Park Drive and follow to the park entrance on the right. Address: Watkins Regional Park, 301 Watkins Park Drive, Upper Marlboro, Maryland. The park is about a half-hour's drive from Washington, D.C. Cost: $10 per car; $20 for mini-buses and limos; $30 for buses; $15 for multi-visit passes for cars and vans (good for three visits). The festival is free on December 25. You may bring canned food items to donate to local food banks for the holidays. You can purchase your tickets in advance online Visit Parks Direct and search for keyword “Festival” under Ticketing. When you arrive, get your Festival Spectacles at the gate for $1 so you can see the magical floating holographic images. Residents Free Night: On December 3, the event will host a free Appreciation Night for the residents of Prince George’s County for their support of the Department of Parks and Recreation programs year around. 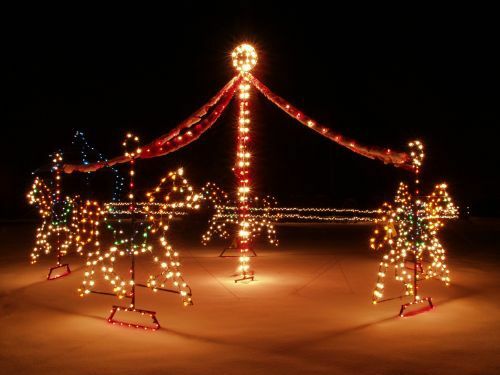 The Christmas Light Display at Watkins Regional Park is a fun family event for all ages. Tune your car radio to some Christmas favorites, and enjoy a drive through a winter wonderland. See holiday lights including reindeer, snowflakes, toy soldiers, Santa, gingerbread men, candy canes, and much more. One of the most popular displays is the Gingerbread House. Enjoy this life-size house as well as the many seasonal displays of lights. Children love the Merry-go-round of Lights. The Washington, D.C. area has many other seasonal activities for the whole family including tree lighting ceremonies, tours of decorated historic houses, holiday festivals, live musical performances, and special events. For fans of Christmas lights, the National Christmas Tree and the Pathway of Peace is illuminated daily at dusk until 10 p.m. Each night in December, musical groups from the Washington, D.C. area entertain visitors on the Ellipse, in front of the White House. This is another memorable way to enjoy the holiday season. Although tickets are required for the Lighting Ceremony, the nightly events following it are open to the general public. 10 Ways to Celebrate the Holidays in Washington, D.C.